Performance History: Helix! New Music Ensemble, Le Poisson Rouge, New York NY, May 1, 2016. 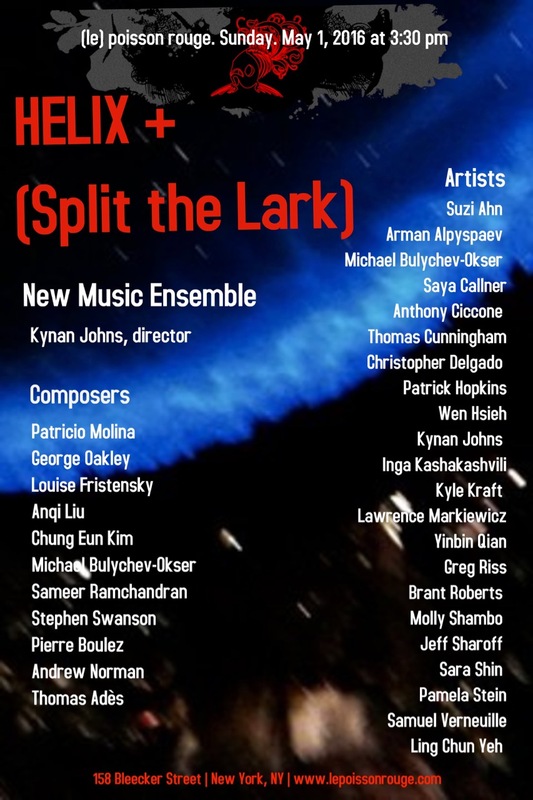 Sara Shin, flute; Anthony Ciccone, clarinet; Michael Bulychev-Okser, piano; Greg Riss & Brant Roberts, percussion; Yinbin Qian, violin; Patrick Hopkins, cello; Saya Callner, conductor. Program Note: Luminous is in many ways a metaphor on the cyclical quality of nature. Influenced in part by Messiaen’s Réveil des oiseaux, the entire work represents a time span from morning through dusk, until dawn the following day. The first part evokes the brightness of morning. Here, a bright sound-quality is enhanced through coloristic interplay between the players. This sound-quality is also characterized by two contrasting themes that persistently play against each other. The second part becomes more free and improvisatory. The slow, introspective opening gives way to a quicker, lighter passage that is both rustic and pastoral. This is the languor of midday and evening. The then introspection returns at the end. The final part represents the dawn and a new beginning. The main theme is introduced in the piano, and the section as a whole is best characterized by a return to the color and interplay first encountered at the start of the piece.